Contact us @ the # listed under "owners" if you have questions. 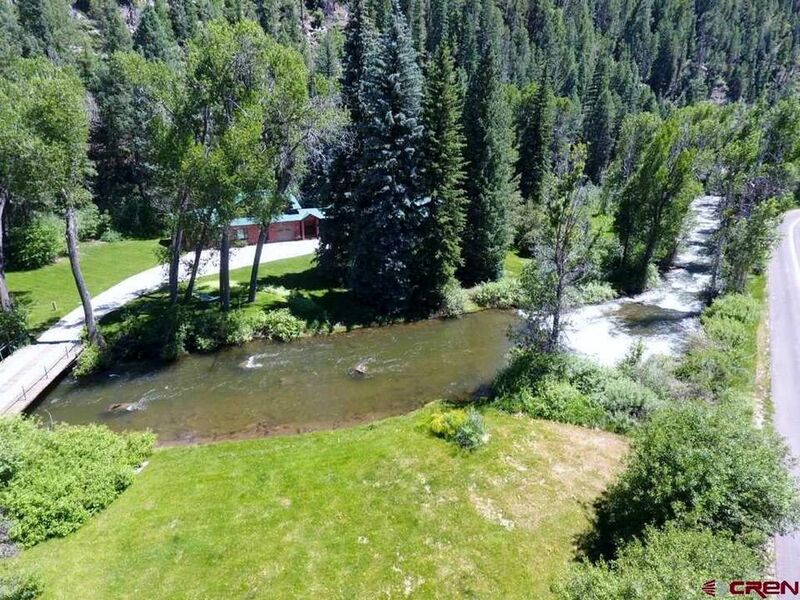 Sitting at an elevation of nearly 7400’ and nestled between over 600’ of Florida River frontage and the foot of a mountain, this property is Colorado at its finest. This amazing, 3.65-acre property enjoys supreme privacy in the heart of the valley surrounded by two large acreage ranches and is just 8 miles to Main Street in Durango. You will arrive at the property on all paved roads and pass over a private bridge to get to the home. The home is set up as two separate, self-contained living areas totaling 3971 sf. (separated by a garage, no common walls). Each side has its own kitchen, living room, bedrooms, baths, fireplace and laundry. You can book one side, or, for larger groups or ultimate privacy you can reserve both sides. For the purposes of this web listing, we are required to list each one separately. This listing is for the "Trout House"...a single story side (3 bedroom). The listing for the 2 bedroom side (the "Bear House") is VRBO listing #1267389. A listing for the whole house (5 bedroom option) will be added soon. This 3 bedroom listing features single level living with a large master suite (with steam shower and jetted tub), 2 additional guest rooms and a 2nd full bath. The Trout House has a wood burning fireplace and offers a full size washer and dryer. There is approximately 2,000 sf so everyone can spread out. The property is in the process of being remodeled/updated to include an all new kitchen and modifications to most all of the rooms. (As rooms become finished we will update pictures on this site.) Relax on one of two porches that overlook the river at the end of the day or with your morning coffee. NOTE: The other side (2 bedroom option) features an open kitchen, dining and family room layout with 2 guest bedrooms on the second floor. This side can easily accommodate 7 guests (master has a king bed, bedroom 2 has three single beds and there is a pullout sofa). There is a bath on each of the floors and laundry on the first floor. There is a river rock fireplace and the kitchen is fully equipped. There is approximately 2,000 sf so plenty of room to spread out. You can access this listing under the same heading as this one, but it is called "2 bedroom option". VRBO #1267389. Crib and high chair are available upon request for either listing. Whichever option you choose (or both for ultimate privacy) this is a perfect location to enjoy afternoons relaxing on the multiple decks, casting dries on the roaring river, enjoying the wildlife or playing on the lush lawns under the soaring trees. The park-like property comes complete with a picnic table, benches, hammock, lawn games and grills. Durango residents: We started visiting the Durango area in the fall of 2013 when our son started school at Fort Lewis College. We quickly fell in love with the area and we decided to make a huge lifestyle change and moved here after spending 25 years in Austin. Once we arrived in Durango, we soon realized that this area is all that we expected (and more). We also knew that we wanted to find a vacation home on the water. When we purchased a small cabin right up the river from this property we knew it was a perfect place to spend quality downtime with our family. We absolutely loved being right on the river and listening to the water flowing by. We opted to put it on VRBO and loved all the people we have met during these past 3 years. The success of the first cabin is what lead us to buy this new and larger property. We just purchased this home in February 2018 and don't yet have any reviews. However, we listed our first property on VRBO in 2014 and we work hard to assure that our guests have a wonderful vacation experience. This new property doesn't have reviews yet, but please look at the link below to find out more about us. You can also call (512/431-9927 Ron or 512/695-0599 Cheryl) to discuss. Thank you for considering either of our properties. www.vrbo.com/643197 We hope that you will enjoy your time at our vacation home as much as we know we will. Location, Location, Location!! As mentioned above, we have another cabin right up the river from this one. The smaller cabin is 1200 sf and we have had multiple times where we've had to turn guests away because we didn't have enough space. This new property has 5 bedrooms and 4 baths and because it has a lock-off, it can be rented as a 2 bedroom or a 3 bedroom. Or, for more space you can take both sides (5 bedrooms) and accommodate a much larger group. Like the other cabin, this new one is directly on the water. It has over 3 acres of land and the property extends to both sides of the river (bring your fishing poles). It is also right at the foot of the mountain. So, with mountains in the backyard and the river in the front yard it doesn't get much more Colorado than that. This property is only 8 miles from town so you get the "away from it all" feel but can be back in Durango with all that it has to offer in just a few minutes. We will continue to update pictures as we make changes or discover new things about the property (we just purchased this property on 2/28/18). The 2 bedroom side (VRBO #1267389) is ready for guests and we hope to finish the renovations to the 3 bedroom side by May. In the meantime, please feel free to contact us with any questions. We look forward to seeing you in Durango!! - Riverfront, fishing allowed, soothing sound of the river rushing - If you want to relax, there are decks, hammock, and a large lawn for leisurely strolls. - Kids (young and old) will enjoy the outdoor games - horseshoes, bocce', croquet, etc. - The 3.65 acres provides for "exploring" on both sides of the river. - Only 8 miles to town!!! toilet, tub, shower, jetted tub, Steam shower is available. We had an incredible stay. The house, property and location, were perfect! Thank you thank you thank you, Cheryl and Ron, for sharing your amazing place! We had the most relaxing stay. The house was so comfy yet very spacious. Everything was just perfect! I can’t wait to plan our next visit. Excellent experience, great to be out of town and have a big yard full of snow! The place exceeded our expectations. Beautiful location!! Since our scheduled arrival was on Christmas Eve, we had asked if there was a Christmas Tree especially because we had young children. When we arrived, there was a fully decorated tree and we were excited for a place to put all the presents. Every year our family picks a Christmas destination, this year we decided on Durango CO. It was an amazing choice- The great adventures started as we drove into Ron's & Cheryl home. The website pictures do not do this home any justice- the home was AMAZING- the setting was BREATHTAKING. Upon arrival we walk into this beautiful decorated -cozy home and saw the home made brownies and that just warmed our hearts- Cheryl made us feel so welcomed. As we explored the house we knew we had found a great home to start our vacation with. The house was equipped with all the things you would need for a family even a high chair for my Grandson. The kitchen has an great layout, which is what we have at our home in Florida. There were enough pots and pans to cook full meals,dishes, cups, glasses, silverware and the appliances were state of the art.This home was immaculately clean, the beds were super comfortable, hot water never ran out. They even had firewood for the fireplace. We utilized the porch and grill, to do some of our cooking, so we could enjoy the snow filled yard and weather. There were enough nice extra large size towels that were soft and plush for everyone there- but at this property I want to say the mattress on the bed were super comfortable. Everyone was able to get a great restful nights of sleep. The little things that you would miss from your own person home were provide by Ron & Cheryl at their River Home. The drive from the property to Durango only took less than 10 minutes which is what we wanted a country setting with a close distance to town. Their was WiFi for our convince. We were able to travel easily to Silverton and surrounding town with ease. I would truly give this property more star ratings, but the max we can give is 5. If you are searching for a property in the Durango area - THIS IS YOUR RARE FINE. If we plan another trip to the Durango area in the future I will definitely stay at Ron & Cheryl s home. We would like to say Thank You for allowing us to use your home to make our 2018 trip such a success. I was looking for a place to take the family and found the winner (we stayed in the 3 bedroom). It can definitely be difficult to tell a place from the photos alone but the reviews were right. This is the perfect place to get away from it all and relax with family. The house is beautifully situated right next to the river with lots of surrounding land and places to sit, lounge or explore. The house is large enough for 8 people and is well appointed with all the kitchen, bedroom and bathroom stuff needed. Cheryl was very helpful and accommodating during our stay. When you arrive there are brownies, snacks, water and coca cola to help get you started. The two rental properties sit near each other with a garage as the dividing point between the two. We were fortunate enough to be there when nobody was staying in the adjoining rental which may be a consideration when large parties are involved. Overall, I could not be more delighted with our stay. Thank you Cheryl! Comfortable, beautifully welcoming, in a serene setting on a river. We loved every minute spent at the Trout House. It had all the personal touches, extremely clean and well decorated, fully appointed kitchen and in a setting you never want to leave. You’re surrounded by trees, with a river just beyond the long porch, with Durango’s downtown only a short 15-20 minutes away. We immediately relaxed and found our 4 days went by way too fast. Cheryl and Ron were perfect hosts. Cheryl even welcomed us with delicious brownies when we arrived. What a great vacation - we definitely will stay here again!! Thanks again for choosing to stay at our river house AND for writing a great review. We are thrilled that your family enjoyed the house and river setting. We look forward to having all of you back!